Click on the map for a larger view. This information comes from pages 471-477 of the 1976 "History of Clinton County Iowa" by the Clinton County Historical Society. 1 Almont Station Elk River PO: 01 April 1871 - 18 Jun 1883. Renamed Almont. 1 Almont Elk River PO : 18 Jun 1883 - 30 Nov 1934. Almoral (No location known) PO : 01 Apr 1871 - 26 Feb 1873. 2 Andover Elk River PO there since 24 May 1886. Formerly Dot. A Beaver Island Clinton/Camanche Mississippi River, E 1/2 in city of Clinton, W 1/2 in Camanche Township. 3 Bliedorn Grant PO : 14 Feb 1898 - 15 Mar 1905. 4 Boone Springs Deep Creek PO : 13 Dec 1853 - 08 Dec 1871. Renamed Goose Lake. 5 Brookfield Bloomfield PO : 10 Dec 1850 - 05 Jan 1872. Renamed Delmar. 6 Brookfield Centre Brookfield PO : 21 Nov 1871 - 12 Dec 1871. Renamed Elwood, moved from Sec. 21 to 16. 7 Brown's Station Waterford PO : 12 Feb 1872 - 18 Jun 1883. Renamed Brown. 11 Calmus Olive PO : 16 Feb 1858 - 25 Jul 1878. Renamed Calamus. PO there since 25 Jul 1878. 12 Camanche Camanche 1836: Dr. George Peck platted town. PO there since 06 Dec 1837. 1838: Elected county seat til 1841. 14 Charlotte Waterford PO there since 06 Dec 1837. 15 Cherry Wood Center PO : 23 Aug 1852 - 11 Oct 1854. Renamed Suffock. 16 Clinton On Mississippi River Formerly New York. PO there since 24 Dec 1855. 17 Delmar Bloomfield PO there since 05 Jan 1872. 18 DeWitt DeWitt Formerly Vandenburg. In 1844 there were 14 families in town. PO there since 17 Apr 1884. 19 Dot Elk River PO : 28 Jan 1886 - 24 May 1886. Moved and renamed Andover. 20 Elk River Elk River PO for Hauntown. PO : 11 Aug 1843 - 05 Dec 1872. 21 Elvira Center Formerly Cherry Wood, Suffock and Suffolk. POs there off and on from 29 Dec 1854 - 28 Feb 1907. 22 Elwood Brookfield Formerly Brookfield Centre. PO there since 12 Dec 1871. 23 Fair Haven (Center) Elk River PO : 20 May 1840 - 01 Mar 1842. 24 Folletts Eden PO : 03 Mar 1884 - 26 Jun 1884 & 14 Jul 1884 - 21 Oct 1933. 25 Goose Lake Deep Creek Formerly Boone Springs. Renamed 08 Dec 1871. PO there since 13 Dec 1854. 26 Grand Mound Orange PO : 18 Oct 1854 - 20 Jan 1859 & 26 Jul 1861 to present. 27 Hermitage Liberty Formerly Sanbornton. PO : 01 Oct 1839 - 01 Jul 1840. 28 Lost Nation Sharon PO there since 20 Nov 1871. 29 Low Moor Eden PO there since 15 Aug 1857. 30 Lyons Now part of Clinton PO : 06 Dec 1839 - 13 Jan 1913. 31 Malone Eden Formerly Ramessa. PO : 09 Dec 1867 - 31 Jan 1922. 32 Massillon Liberty PO : 01 Aug 1844 - 16 Aug 1851. Massillon moved to Cedar Co.; another town sprung up on the Clinton Co. site and named Toronto. 13 McClure SW of Clinton PO : 14 May 1884 - 24 Jun 1884. Renamed Chancy. 34 Monroe Eden PO there from 1837 - ?. 46 Old Welton Welton English settlement, also called Hull. 2 miles N of Welton. PO : 20 Jun 1851 - 04 Oct 1870. 35 Orange Orange PO : 12 Sep 1853 - 23 Jul 1879. 36 Petersville Waterford Formerly Quigley. PO : 28 Jun 1902 - 31 Oct 1935. No longer exists. 36 Quigley Waterford PO : 11 Sep 1883 - 28 Jun 1902. Renamed Petersville. 37 Ramessa Eden PO : 15 Aug 1857 - 19 Nov 1858. Renamed Malone and moved from Sec. 20 to Sec. 24. 38 Riggs Waterford PO : 07 Mar 1872 - 02 Jul 1873 & 11 Mar 1874 - 31 Jan 1907. 27 Sanbornton Liberty PO : 30 Jun 1837 - 01 Oct 1839. Renamed Hermitage. 39 Schick General Hospital Station 2604 N. 4th St., Clinton PO : 1943- 21 Feb 1946 & 03 Jun 1948 - 01 Nov 1948. Later became VA Center Station. 40 Spring Rock Spring Rock PO : 19 Oct 1840 - 23 Sep 1862. 21 Suffolk / Suffock Center PO : 11 Oct 1854 - 29 Dec 1854. Renamed Elvira. 41 Teeds Elk River PO : 21 Jun 1883 - 08 Jul 1904. Renamed Teeds Grove. 41 Teeds Grove Elk River PO : 06 Jan 1873 - 21 Jun 1883 & 02 Jul 1965 to present. 42 Ten Mile House Deep Creek PO : 25 Aug 1870 - 15 Mar 1871. Moved and renamed Bryant. 32 Toronto Liberty Formerly Massilion. PO there since 13 Sep 1852. 39 Veterans Administration Center Station 2604 N. 4th St., Clinton PO : 16 Apr 1950 - 18 Aug 1965. 18 Vandenburg DeWitt PO : 09 Jun 1842 - 14 Apr 1844. Renamed DeWitt. Van Horn (No location known) PO : 12 Apr 1871 - 17 May 1873. 44 Villanova Washington PO : 10 Mar 1884 - 05 Apr 1890 & 02 May 1890 - 13 Jan 1894. See White's. 45 Watkyn's Glen Elk River PO : 23 Jul 1874 - 09 Dec 1874. 34 Waubesepinicon Eden PO : 1837. See Monroe. 46 Welton Welton Moved and re-established. PO there since 30 Apr 1871. 48 Wheatland Spring Rock PO there since 19 Jun 1858. 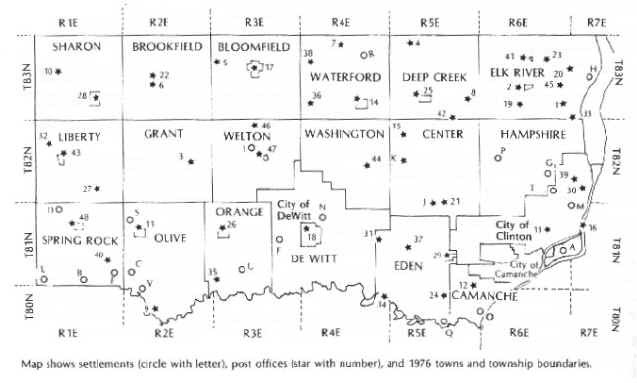 *It is indicated that this info comes from David C. Mott, "Abandoned Towns, Villages, and Post Offices of Iowa," Annals of Iowa 17:6, October 1930, pp. 435-543; Wolfe; Allen; Atlases of Clinton County, 1875, 1905. The post office info comes from Mott, ibid., 463-4; Guy Reed Ramsey, Postmarked Iowa Postal History Society, "United States Post Offices in Clinton County," Alphabetical Listing of Iowa Post Offices, 1833-1970. Also see the Clinton Herald's "Once Upon A Time" section by Everett A. Streit, 03 Jan 1995. Note that some of the dates differ depending on which source you refer to.